You may already be familiar with Cecelia Louie of Paper Zen, a talented quiller and die cut designer. When she offered to do a guest tutorial for making origami lucky stars (also known as folded puffy stars) it was an offer I couldn't refuse! Cecelia has a knack for breaking down steps so they are very easily understood. 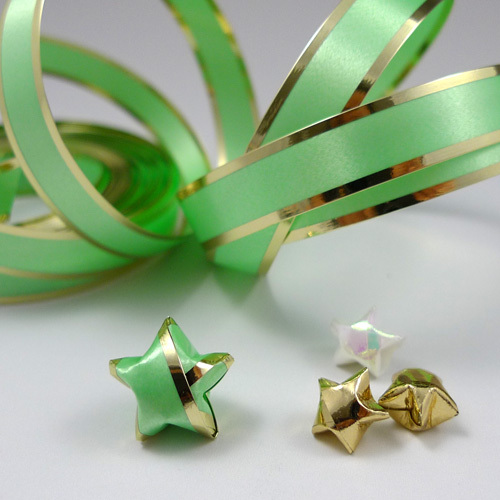 Lucky Stars are a wonderful way to decorate a package, a card, or even a tree. String them on stretchy cord to make a bracelet or fold 365 stars and put them in a jar to give to someone special, showing that you think of them every day of the year. I have folded several thousands of stars. For my wedding invitations, I wanted a string of stars to come dancing out of a jar and managed it by folding them around a long thread. I attached one end of the thread to the jar's lid, so when it was lifted off, the string of stars came with it as a little surprise. Material: Strip of 24-lb [copy] paper 8" long x .5" wide. Ribbon is an ideal alternative for paper when making stars because of the metallic sheen and ready-to-go widths. Vary the length and width depending on your materials. 1) Take one end and wrap around the middle of the strip. 3) Push the knot to one end. 4) Gently compress the knot flat but do not crease sharply. This forms a pentagon with two ends sticking out. 5) Fold the long end across the pentagon. Tuck the small end behind the pentagon. 6) Gently press, but again, do not crease sharply. 7) Flip over the pentagon and fold the long end across the pentagon. 8) Continue repeating step 6 and 7. 9) When you reach the end (cut off excess if needed), you will see two overlapping flaps within the pentagon. 10) Tuck the tail under the two flaps. 12) Using your fingernails, push two sides into the center, puffing up your star. 13) Continue rotating the star and puffing. 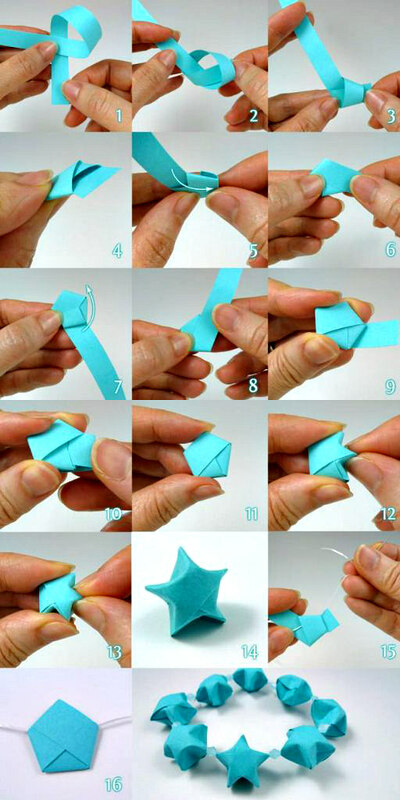 15) For a string of stars, start folding the pentagon around a thread. 16) Completed star, folded around a thread, ready for puffing. Thanks for this tutorial, Cecelia, and also for providing these free, printable card backgrounds and envelopes. 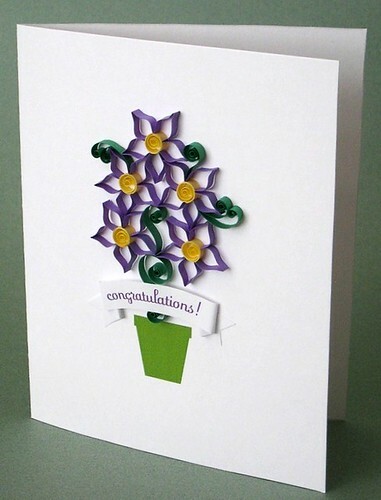 The card blanks are perfect for quilled flowers (here's her Paper Zen blog post about them). Not only are we kindred spirits in quilling, but Cecelia designed a beautiful mystery box project for my All Things Paper book that I think you'll enjoy. 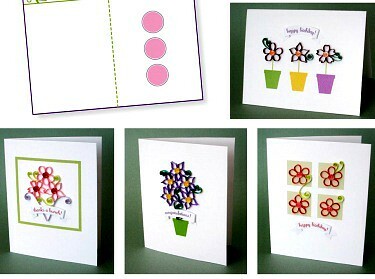 Stay up-to-date with her latest designs via Paper Zen and visit Cecelia's Etsy shop, Paper Zen for stylish cutting files. nice creations, love the boxes and her quilling !!!! OMG! Cecelia so totally rocks! I've been a huge fan of hers always but her stars are SUPER cute! Wow. That little origami ribbon star is amazing! Always a job to discover all the paper things here! Thanks, Ann! I am a huge fan of Cecelia's flowers and I think her animal favour boxes are adorable. Ann, I looking forward to the release of your book in June as well as seeing mystery box project of Cecelia's!! Love the tut on the lucky stars and seeing more of Cecelia's unique style of quilling.